Forever Home Donkey Rescue is a private sanctuary and not registered as a 501c3 non-profit organization with the Internal Revenue Service. We are located in Benson, AZ, which is east of Tucson. 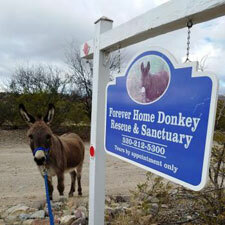 The donkeys and Casper the mini-mule that reside here thank you for visiting our web page. We appreciate at least 24 hours notice if you would like to visit, but we will try to accommodate shorter notice. Unfortunately, it is not always possible, due to prior commitments by the people who live and work here. So let us know as soon as possible. And don’t forget to check out our BLOGSPOT for up to date happenings here at Forever Home Donkey Rescue! A small private sanctuary for donkeys managed by John & Tish Hiestand.